In the 1800s, two scientists — Nikola Tesla and Galileo Ferraris — separately invented their own versions of AC induction motors. Such AC motors turned out to be reliable alternatives to the DC motors that were popular at the time. 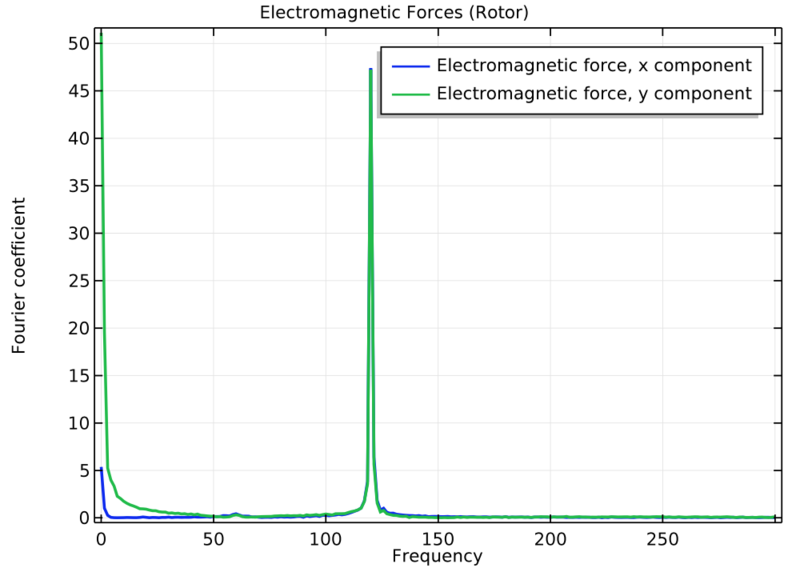 To accurately study induction motors, we must account for the multiple physics that occur. 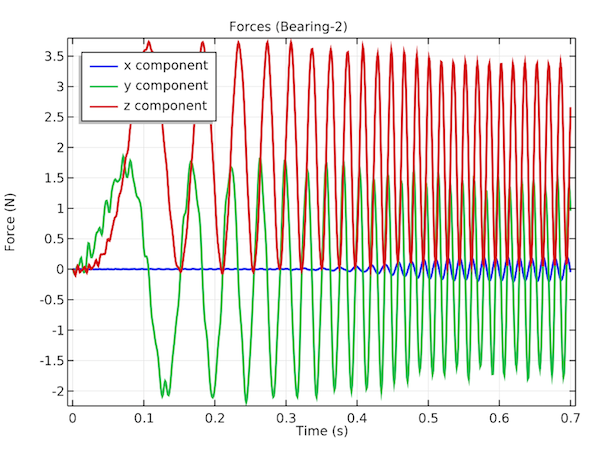 As today’s example illustrates, we can include the electromechanical effects in version 5.3 of the COMSOL Multiphysics® software. While both Nikola Tesla and Galileo Ferraris built early versions of AC induction motors in the 19th century, Tesla (a large proponent of AC) is more often credited with the motor’s invention. This device turned out to be a popular machine, with future iterations proving to be durable, reliable, and adaptable. Left: A Tesla induction motor. Image by Ctac — Own work. Licensed under CC BY-SA 3.0, via Wikimedia Commons. Right: A modern three-phase induction motor. Image in the public domain, via Wikimedia Commons. 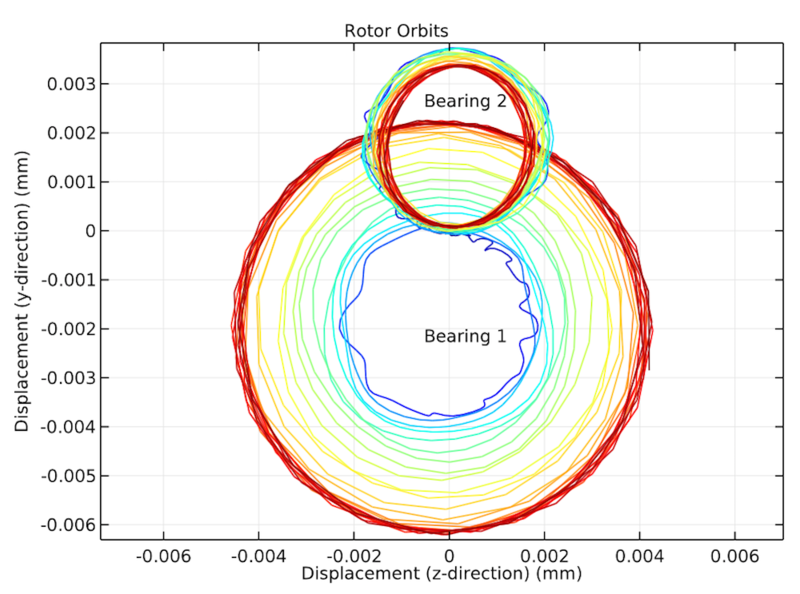 Engineers can continue to improve these motors by accurately analyzing their performance, something that requires accounting for all of the relevant physical effects. To accomplish this, we can couple the Multibody Dynamics Module and AC/DC Module to analyze electromechanical effects in a three-phase induction motor. A new example model, added to the Application Gallery in COMSOL Multiphysics® version 5.3, demonstrates this functionality. 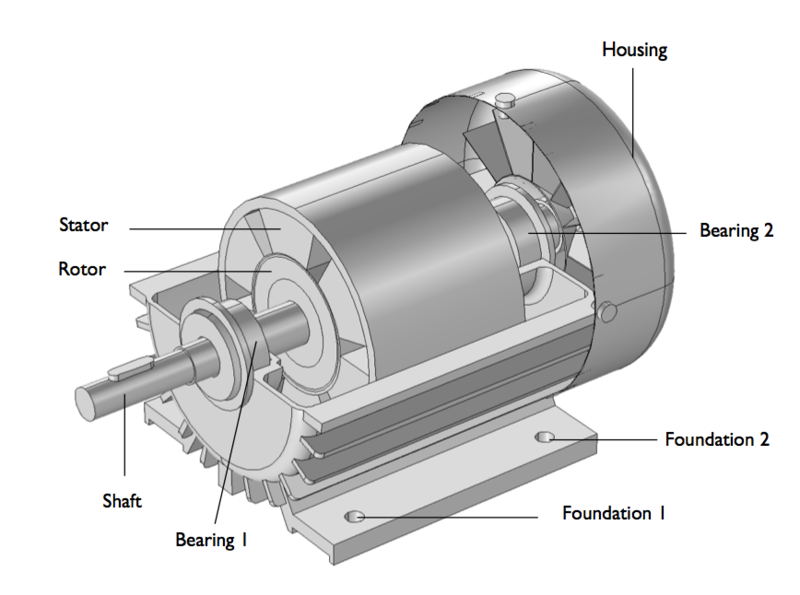 We can see all of the parts included in the 3D model of a three-phase induction motor in the schematic below. 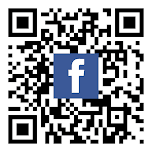 We physically model each part except for the bearings and foundation, which we model as massless springs. 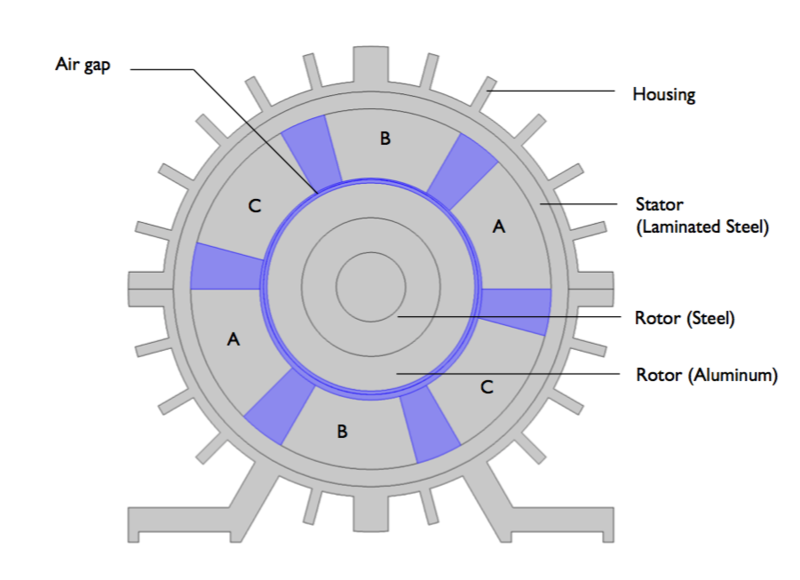 The geometry of the three-phase induction motor housing assembly. In this example, the stator and rotor are slightly misaligned, causing the small air gap between them to be asymmetric. As a result of this asymmetry, vibrations occur in the motor, which can be analyzed with simulation. To induce eddy currents into the rotor, we rely on the rotor’s rotation and time-harmonic currents in the stator windings. Next, we perform two different studies: a 2D electromagnetics simulation and a 3D multibody dynamics simulation. 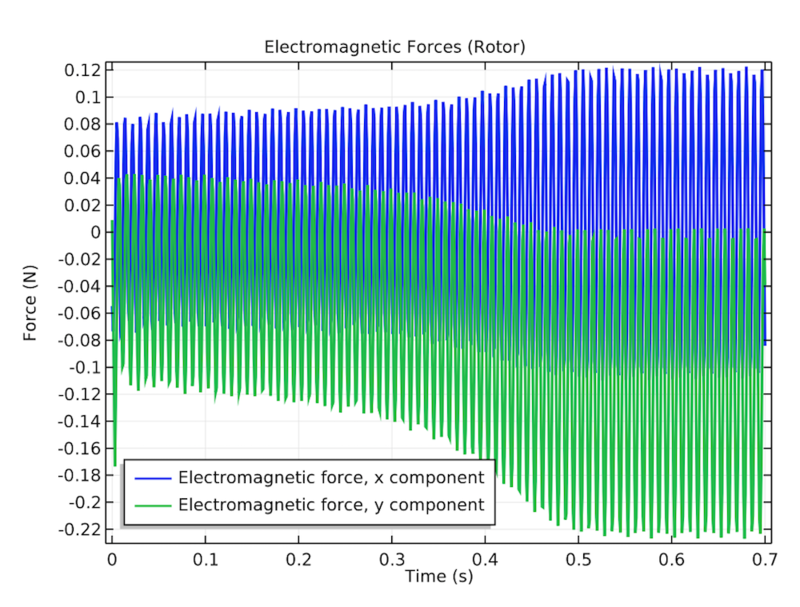 In these studies, we use the Rotating Machinery interface to account for the motor’s electromagnetic fields and the Multibody Dynamics interface to simulate the rotor’s motion and housing vibration. This 2D geometry, shown in the cross section below, is a transverse section of the full 3D geometry. We also apply an alternating current of 60 Hz to the stator winding in this geometry via a Homogenized Multi-Turn Coil feature that has 2045 turns. For more information about the geometrical dimensions and electromagnetic model, check out the references in the model documentation. A cross section of a three-phase induction motor model. The three different coil regions in the stator (labeled A, B, and C) represent the motor’s three phases. Switching gears, let’s explore the multibody dynamics case. This time, we use the full 3D geometry and model the stator, rotor, and shaft as rigid, with the rotor rigidly mounted on the shaft. The elastic hinge joints between the rotor and structural steel housing represent the bearings, which support the rotor and transmit its forces to the housing. As for the housing, we assume that it is elastic and use elastic fixed joints to connect it to the foundation. 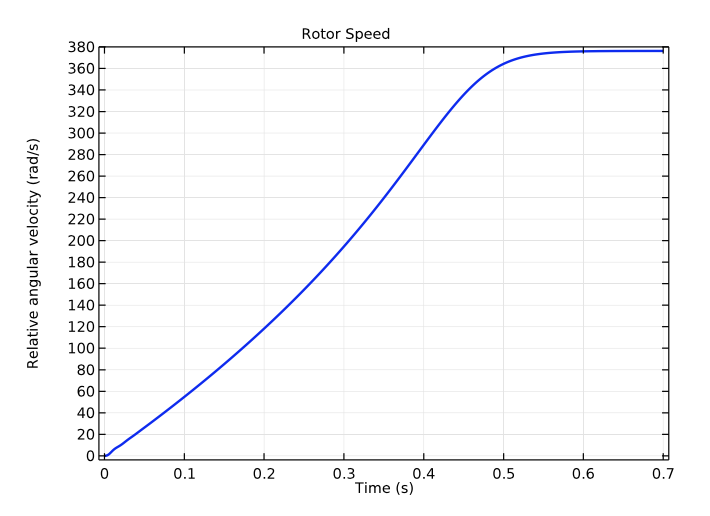 To compute the rotor’s angular speed, we use rotational torque, which is calculated as a function of time. Using calculations from both of these cases, we run an electromechanical analysis that couples our electromagnetics and multibody dynamics simulations. For instance, we add values calculated with the Rotating Machinery interface — such as the electromagnetic forces caused by the stator and rotor misalignment and the electromagnetic torque — to the rotor and stator in the Multibody Dynamics interface. We can find the rotor’s speed by combining these interfaces once again, transferring the hinge joint’s angular motion computed in the Multibody Dynamics interface to the Rotating Machinery interface. Let’s now take a closer look at the magnetic flux density norm over time and the rotor’s electromagnetic forces. When calculating these electromagnetic forces, we observe vibrating forces in the transverse direction that are caused by the misaligned stator and rotor. The magnetic flux density norm of the rotor and stator over time (left) and the rotor’s electromagnetic forces in both the transverse and axial directions (right). In regards to electromagnetic torque, when the rotor speed equals the stator electrical frequency, the electromagnetic torque falls to zero if there is no loading torque on the shaft. The time delay for the rotor speed to equal the stator electrical frequency is dependent on the rotor’s inertia. In this case, the rotor takes 0.7 seconds to achieve a steady-state speed. 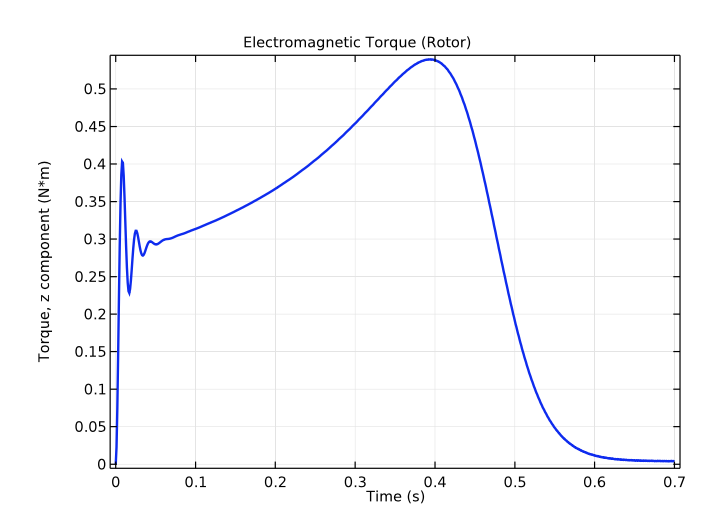 The rotor’s electromagnetic torque (left) and angular speed (right) as a function of time. To find areas of high stress in the motor, we combine our analysis of the rotor’s velocity with the housing’s von Mises stress distribution. As indicated in the animation below, the areas near the bearing and where the housing and foundation connect have the highest stress values. The housing’s von Mises stress distribution and the rotor velocity profile. 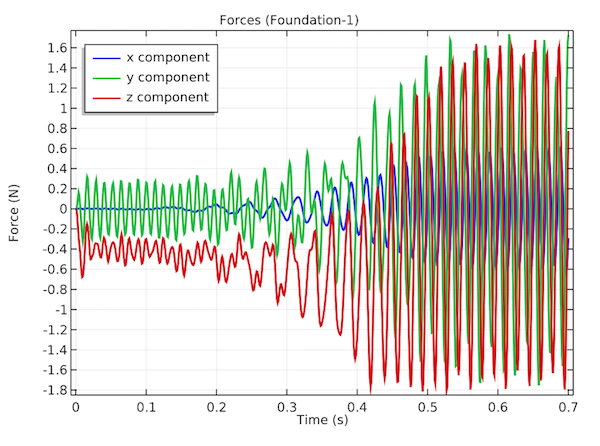 The plots below explore the forces acting on Bearing 1, Bearing 2, and Foundation 1 as a function of time. These forces travel through the elastic housing to the motor foundation. The forces on Bearing 1 (left) and Bearing 2 (middle) in the transverse and axial directions. The forces at the connection between the housing and foundation at the location of Foundation 1 (right). By analyzing the frequency spectrum of the electromagnetic forces, we can conclude that the frequency is 120 Hz, double the stator electrical frequency. 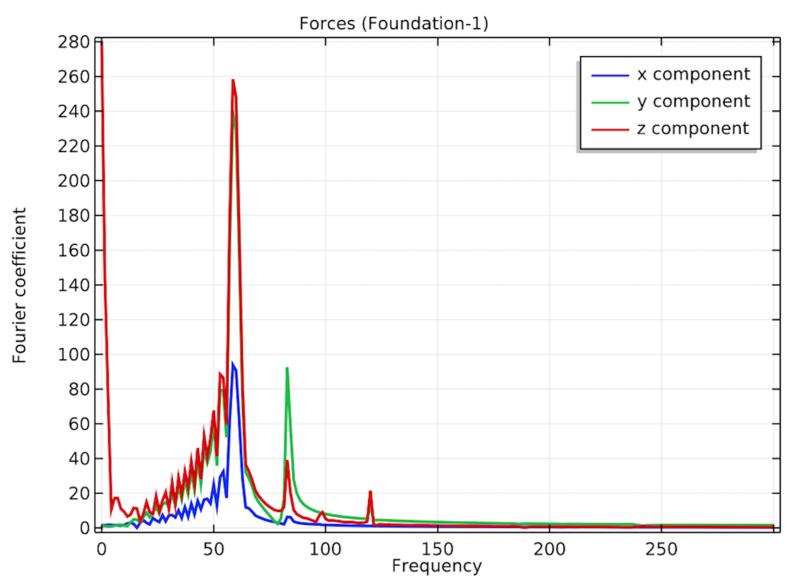 Despite this, the frequency spectrum plot for the housing-foundation connection shows a dominant frequency contribution of around 60 Hz, with a few peaks around 83 Hz — the first natural frequency of the induction motor’s housing assembly. The frequency spectrum of the rotor’s electromagnetic forces (left) and forces in the housing-foundation connection (right). Lastly, let’s examine the rotor’s orbital motion, which results from the rotor vibrating in the transverse direction, with respect to the stator. This occurs due to the electromagnetic forces acting on the rotor in the transverse direction and the finite stiffness of the bearings supporting the rotor ends. The orbits seen in the following plot are not concentric due to the rotor’s asymmetric inertia in the axial direction. Rotor orbital motion, combining its rotation and vibration, at both bearing locations. 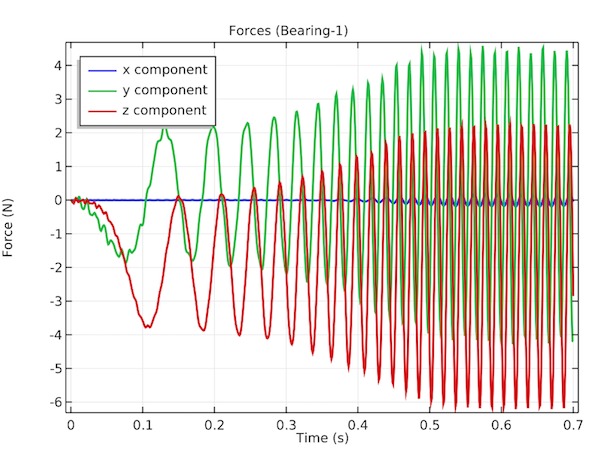 Want to take this electromechanical analysis for a spin? Access the tutorial model with the button below.